sunshine and whimsy. : summer goals. It's officially summer vacation (for me; Tony has to work until July 15 and then he has 3 weeks off)! I'm staying in Beijing with T and then we'll be flying to Canada! When we decided I'd stay in Beijing, T asked me what I would do all day while he was at work and my response was pretty much, "Uhh... don't worry. I'll have lots to fill my days with." Besides wanting to blog more often and read more books, I have a lot of stuff I wanna get done! Apartment painted: Our apartment was painted when we first moved in 3 years ago, and since we'll be here for at least another 2 years, I figure it's time for a refresh. Our school's maintenance guys will paint it (maybe even this weekend! ), so we just need to take stuff off the walls and pack some stuff up. It's just being repainted white, but I'm still excited! Wash curtains: It's been almost 2 years (I think) since we washed our curtains. (Is that gross to admit?) I'd wash them more often but we need the maintenance guys to help take them off because they're on a curtain rod that is difficult to take down. Since they'll be here painting, perfect time! "Tidy" apartment: Go through everything and get rid of clutter! Read Taking Charge of Your Fertility: Okay, so the title of this book is a little misleading, so I'll say it again: We're not trying to have a baby! That being said, I do have problems with my hormones and have been told I may have PCOS. This book has chapters on those subjects as well as other women’s gynecological and sexual health subjects. I'm looking forward to learning more about these things and hopefully taking more responsibility for my health. Pap test: Related to the above, gotta get that yearly (dreaded) pap test. See dermatologist: I have a family history of skin cancer, plus, it's just good sense to get checked. DesignLoveFest's social media course: I bought this course when it launched in March, but haven't made the time to do it until now. Yay, summer vacation! A Beautiful Mess' Blog Life course: Another course that I bought ages ago, and haven't completed. Yay, summer vacation! Change classrooms: I'm still teaching preschool next year, but I'm moving to a different class. I gotta move all my stuff and set up this summer. Phew! At first I thought that wasn't a lot to get done, but now that I've listed it all out, it kinda is. Wish me luck! 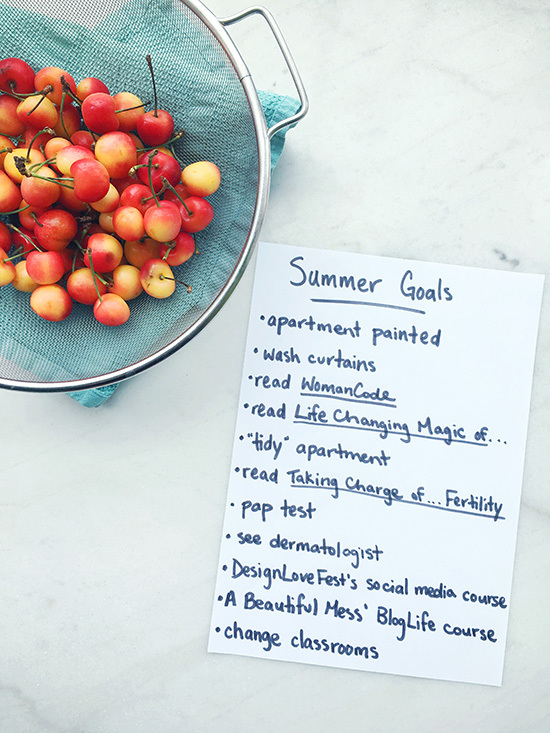 What do you hope to get accomplished this summer? P.S. Highlights from Tony's first summer in Canada.